San Francisco has a program Pavements to Parks instigated by the Mayor. Unused or ugly spaces are made into Parklets, mini green areas for people to enjoy. In some places they remove a couple of parking spaces to widen the footpath & allow café trading & eating in this area. 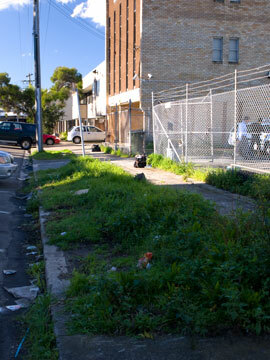 Where there is room, areas in the middle of the road have been made into green spaces for people to use. They are not playing sport, rather sitting alone or in groups talking to each other. 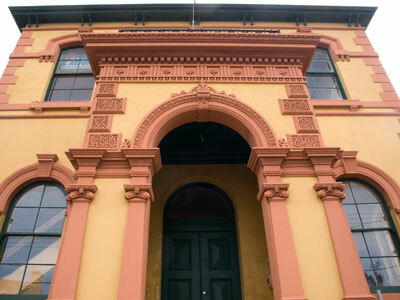 The Alpha Club who are leasing & renovating the old Marrickville Council building have created an area next to the footpath that allows people to sit in a green area. It's very new, but it is already very nice. My photo doesn't do it justice. Parklets have been called ‘quality-of-life generating spaces’ & I would 100% agree with this perception. The presence of Parklets support a pedestrian culture & encourages people to walk or ride. San Francisco intends to establish 35 other Parklets over the next 12 months. As urbanisation becomes denser with more people living in areas & with new buildings unlikely to incorporate any serious useful green space, Parklets are going to be what builds communities & helps retain sanity. They are cheap to create & maintain & the sky’s the limit in the creativity & beauty they can bring. I think they are a great idea & already needed in Marrickville LGA. We have so many areas that are concrete wastelands. Parklets don’t have to be along the main shopping strips. They can be created anywhere that has some space. The people will use a Parklet if it is there. Just last week I saw 2 people sitting on chairs that they had carried from their home to a concreted space that was in the sunshine. They were sitting drinking coffee & talking. What was noticeable was that they were not near residential buildings. I believe spaces like these encourage people outdoors. Being smaller than a park, they increase the likelihood that people will speak with each other. Fostering good relations is all part of building communities. Parklets would also encourage people to look after an area in terms of less littering & tagging by creating community pride. They will also have the added benefit of helping to lower the Heat Island effect & if the plants used provide food for nectar-eatung birds, then the benefits only increase. To my mind the benefit of Parklets are too numerous to ignore. There is a 3.44 minute video that shows a few of the new Parklets in San Francisco & I think it is worth the time spent viewing. There is a few seconds that sound like an advertisement. Ignore this section because better shots of Parklets follow. A baker’s dozen or it dozen matter? Yesterday I received an e-mail from Voren, a local resident which included a bunch of photos of mutilated street trees on Riverside Crescent Dulwich Hill. These photos are a perfect example of how the streetscape can be ruined by pruning for electricity cables. I was extremely happy to receive these & welcome any photos or addresses of public trees you think is worth the attention of SoT. My e-mail address can be found on the About me page. 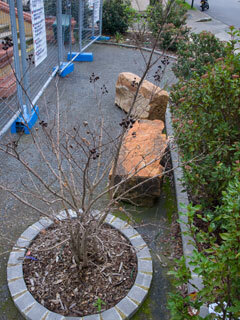 On 26th January 2010 the Cumberland Courier ran another street tree article titled Tears for mutilated trees. 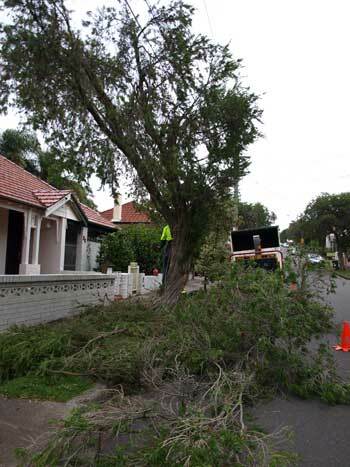 This time the residents of Lalor Park were distressed at the state Integral Energy left their 50-year-old street trees after pruning for overhead wires. Terms such as “hacked,” “massacred,” “mutilated” & “butchered” were used to describe the aftermath. Back in October 2009 Blacktown City Council put Integral Energy on notice about their pruning practices after they had pruned the trees in Riverstone & surrounding suburbs. When they saw what happened to the street trees in Lalor Park, Blacktown Council stepped in & suspended Integral Energy’s powerline clearance pruning work. Integral Energy apologised & now has to work under the supervision of Blacktown Council, review their tree pruning practices & fulfil a range of other requirements. Hallelujah! Finally a municipal council stepping in to ensure the street trees are not mutilated to the point where it is questionable whether they will survive, where the streetscape is marred for many years, where once beautiful trees are ruined forever & where people have to lose an essential part of what makes a street a desirable place to live as well as the negative impact on property values. It may be that a council has stepped in before, but apart from Mosman Council doing so many years ago, I am unaware of this. 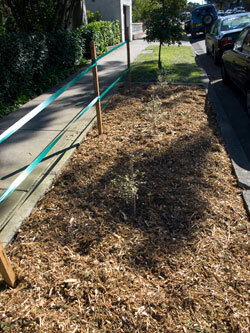 The Lalor Park residents say they no longer have shade on the street or footpath. 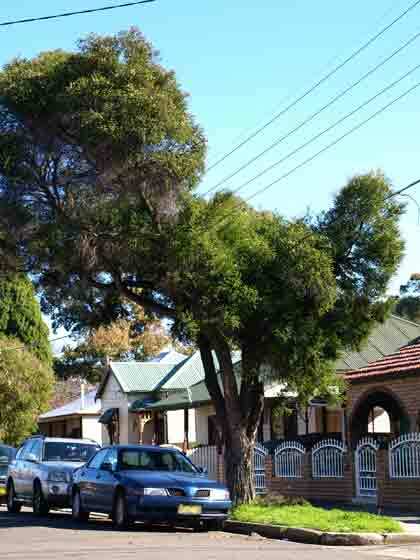 I can attest to that as my own street lost the shade from the street trees after recent pruning by Energy Australia. When the sun is overhead we now have the long shadow of the electricity & pay TV cables instead of shade from street trees. Frankly it looks weird & of course it is hot. You can’t stand under a street tree having a chat to your neighbours anymore. You have to look for shade & move to it, either on private property or walk across the road where the street trees were only slightly pruned. This apparently small thing will have an impact on community relations over time. This is a great article from the Cumberland Courier with much more information than I have reported. You can read it by clicking on the following link – http://cumberland-courier.whereilive.com.au/news/story/tears-for-mutilated-trees/ I thank the Cumberland Courier as they have been reporting on trees frequently of late. Friends of the Urban Forest in San Francisco USA recently posted a call for help on their web-site asking residents to alert them to public trees which have been illegally pruned. Friends of the Urban Forest & the Bureau of Urban Forestry (don’t you love these names) have planted 10,928 new street trees in San Francisco since 2003. About street trees they say, “The small, younger trees currently provide very little environmental benefit…” meaning that if older more mature trees are removed due to heavy pruning which weakens them or makes them way too ugly, then replacing them is not as good as a solution as it seems on the surface. Personally I am worried that in our LGA we will reach the stage where we will have more young trees with thin trunks than we will have older trees. Older trees sequester greater amounts of CO2, filter more particulate matter & other pollutants (though you need leaves to do this & there are plenty of trees with thick trunks, but with relatively few branches & leaves after pruning in Marrickville LGA), produce larger amounts of oxygen & collects more storm water runoff than does a tree with a thin trunk. We can already see in some areas of our LGA that the skyline has few tall trees. I think it is a shame that we can count the trees visible along the skyline. This is not the case in many other suburbs of Sydney metropolitan area where the overall look & feel is green because their canopy is substantial. We need to keep as many of the large stature street trees as we are able & our young trees need to be given a chance to grow up because it is then they provide the most benefit. Severe pruning clearly demonstrated in Voren’s photographs not only makes the tree ugly & negatively impacts the streetscape & our lives, but also weakens the tree making it more susceptible to disease. A weakened & diseased tree will be more likely to fall in a storm or some other event that places pressure upon it. I do understand that street trees need to be pruned for the passage of overhead wires & I have never advocated that this should be stopped. I do believe however that our electricity companies can do a much better job of pruning & Blacktown Council’s intervention has proved this. Tempe Wetlands - how will the RTA put a major arterial road over this without destroying it? On a final note, a local community group called Tempe 2010 is holding a rally on Saturday 6th February at 11am meeting in South Street (between Hart & Fanning Streets) Tempe. 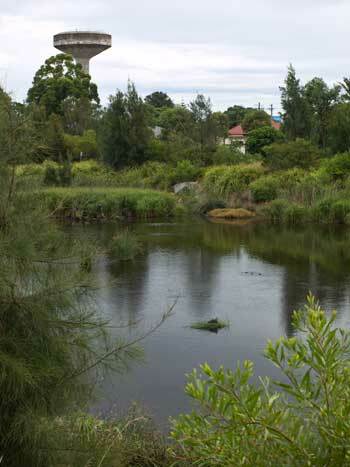 They are opposing the building of a new arterial road that is to go over the Cooks River, across the newly renovated Tempe Reserve & over the top of the lovely Tempe Wetlands ending at a t-section at Sydney Park. SoT is interested not only because of the obvious factors of more roads, traffic, noise & pollution, but also because the Tempe Reserve is likely to be grossly affected & the damage to the wetlands is a real concern. There is also the question of how many trees will need to be removed to build this new road. The Greens have been in the Inner West Courier about this issue recently & have stated they are against this project as it stands. I hope the other councillors look into the impact of the new arterial road & decide to publicly oppose it if it is indeed as environmentally destructive as it seems to be. I say ‘seems’ because I haven’t looked into the literature as yet. I thought this article was interesting when comparing our own energy companies in Australia who, as I understand it, have carte blanche over both private & public trees if they consider them impeding electricity cables. I remember being astounded that the stumps of large mature Elm trees, which were chopped down by Energy Australia in Salisbury Road Camperdown mid 2009, were left for Marrickville Council to remove. Not only had the community lost several mature & very beautiful trees, but we also had to pay for the stump removal as well. So, for the equivalent of a municipal council in America having the power to require the manager of Customer & Community Relations to give good reason why 12 public trees needed to be cut down is very interesting & highlights the difference in community attitudes towards public trees. I sincerely believe that, if the Australian community & elected officials seriously challenged the way street trees are pruned for cables, our power companies would make changes. Power is no longer a monopoly & they are hungry for our business. I know because energy providers knock on our front door several times a year to try to lock us into a contact with them. In San Francisco USA a group called Friends of the Urban Forest have set up a program where for US$75 you can have tree planted wherever you want on the footpath provided there are no utilities underneath which would be adversely affected by digging. I don’t know whether Friends of the Urban Forest is a community group, part of council or a partnership between both. Regardless, what a wonderful program. The right trees get planted in the right places & all the support & education needed is provided & the community has a say. As far as I can gather, in America generally the saplings they plant are 1.8 to 3 metres tall & quite established.